J. C. W. Illiger is the author of the original taxon. 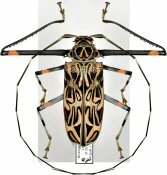 The type species is Cerambyx longimanus Linnaeus, 1758. Acrocinus Illiger, 1806 is the full name of the group-genus in the taxonomic classification system. Acrocinus has 1 species. The genus is ranked in the Acrocinini tribe of Lamiinae.